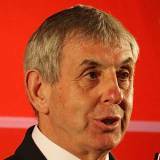 Sir Ian McGeechan possesses one of the most distinguished careers in the world of rugby. He began as an outside half for Headingley before winning his first cap for Scotland against New Zealand at Murrayfield in 1972. During a distinguished playing career McGeechan played 32 times for Scotland, nine as captain, and toured with the British and Irish Lions in 1974 and 1977. These Lions tours would be the beginning of a legacy with the touring side that would extend into his years as a coach. After a knee injury ended his playing career aged 33, McGeechan was appointed as Scotland's assistant coach for the 1987 Rugby World Cup. He took charge of Scotland in 1988 and a year later he rekindled his association with the Lions, coaching the side on their successful tour of Australia. In 1990 he led the Scots to an historic Grand Slam in the Five Nations and in his second Rugby World Cup in 1991, McGeechan led Scotland to the semi-finals where they were narrowly beaten 9-6 by England. McGeechan's next challenge was as director of rugby at English club Northampton Saints, whom he joined in 1993 before venturing to New Zealand with the Lions. Four years later he claimed a notable double by steering the Lions to a series victory over South Africa having achieved the same feat as a player in 1974. In 1999, he re-joined the Scotland set-up, and in 2003 was appointed as Director of Rugby. McGeechan's second spell with the Scottish side was less successful than the first, and in 2005 he was appointed as Director of Rugby with English Premiership side London Wasps. He was part of Clive Woodward's staff on the 2005 Lions tour of New Zealand having seen Wasps claim the Anglo-Welsh Powergen Cup by beating Llanelli Scarlets at Twickenham. In 2007 his side beat old rivals Leicester to lift the Heineken Cup and McGeechan's success would continue in 2008 as he led Wasps to the Guinness Premiership title with victory over the Tigers in the Twickenham finale. Later the same year he accepted an invite to lead the Lions to South Africa in 2009 and so took a sabbatical from his role with Wasps during the 2008-09 season and at the end of that campaign he stood down from his post with the Premiership club. The Lions were narrowly beaten by the Springboks 2-1 in a brutal Test series and later the same year he was knighted by The Queen in the New Year Honours list for his services to the sport. McGeechan returned to rugby in 2010, accepting an advisory position with Premiership side Gloucester before taking on the role of performance director with Bath ahead of the 2010-11 season. And following Steve Meehan's departure from the Rec at the end of the 2010-11 campaign, McGeechan took sole control of Bath alongside his coaching staff which consisted of Brad Davis and Martin Haag. Bath laboured at the start of the 2011-12 season and McGeechan was under-pressure to turn around the fortunes in the West Country following a run of results which saw Bath lose seven in eight games in the run up to Christmas. Their season showed no signs of improving, with a home defeat to Northampton in April proving pivotal as McGeechan's contract was not renewed.